Forgotten Hollywood » Blog Archive » “Forgotten Hollywood”- Authorized Disneyland Locale Shoot! « “Forgotten Hollywood”- Charlie Chaplin Novel Available! “Forgotten Hollywood”- Authorized Disneyland Locale Shoot! 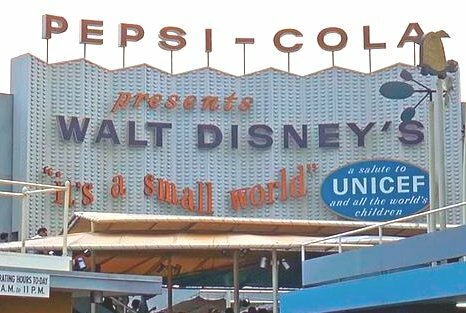 When It’s a Small World debuted at the New York World’s Fair in 1964, the exterior appeared very different than it does today at Disneyland. The now famous golden spires and Mary Blair inspired architecture facade didn’t appear as the entrance. The exterior canals were also covered with numerous angled coverings, much like the ones being installed for the filming of Tomorrowland. This entry was posted on Thursday, February 6th, 2014 at 12:27 am	and is filed under Blog by Manny Pacheco. You can follow any comments to this post through the RSS 2.0 feed. Responses are currently closed, but you can trackback from your own site.